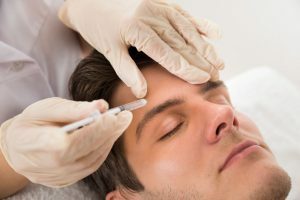 Botox injections are the best known of a group of medications that use various forms of botulinum toxin to temporarily paralyze muscles. The toxin is produced by the microbe that causes botulism, a type of food poisoning. It is used in extremely dilute amounts from purified, commercially available, FDA approved extracts. These injections are primarily known for their ability to reduce the appearance of some facial wrinkles. They are also used to treat a variety of spastic related problems (abnormal muscle movements) such as repetitive eyelid, face and neck spasms (cervical dystonia), excessive sweating (hyperhidrosis), spastic paralysis following spinal cord injuries or stroke and other spasm associated conditions. Botox injections are also approved for the prevention and amelioration of chronic migraines. At Herrera Reconstructive Surgery we routinely use Botox to successfully treat these various conditions.